Here’s a brief article that was written about Donut Dollie Dorset Hoogland in her hometown newspaper, the Martinsburg Journal, back in 1969. 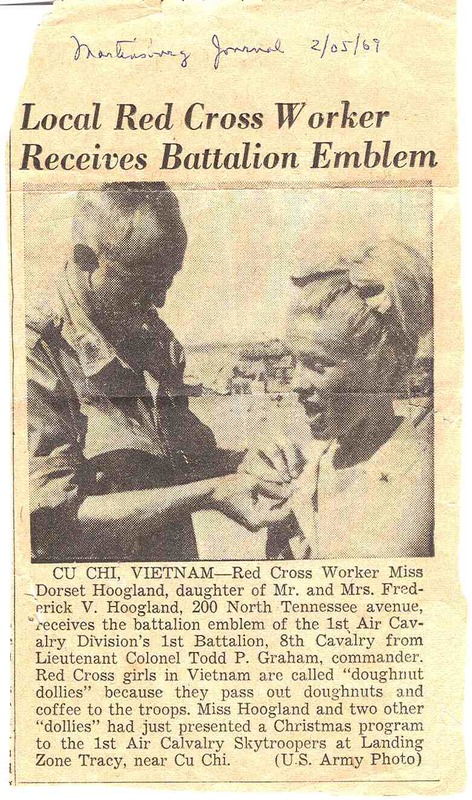 The picture shows her receiving the battalion emblem of the 1st Air Cavalry Division’s 1st Battalion, 8th Cavalry from Lieutenant Colonel Todd P. Graham, commander, after performing a Christmas program with other Donut Dollies for the 1st Air Cavalry Skytroopers at Landing Zone Tracy, near Cu Chi. 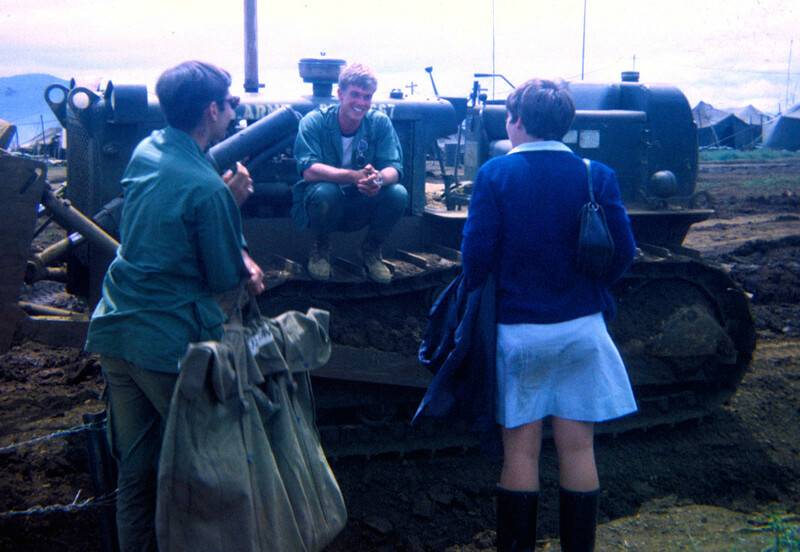 Earlier this year we set up a Facebook page to help spread the word about our documentary, and it turns out that many Vietnam Veterans have been sharing their memories of the Donut Dollies and thanking them for their service. In less than six months, we received nearly 4,000 likes and hundreds of great comments. Below are just a few. Please feel free to post and share memories, photos and other memorabilia here on DonutDollies.com, too! They made a lot of troopers Happy , by just being there and talking to “US” and making you feel Special. No matter who you were. HOOAH. I knew, cherished and loved the Dollies at Tuy Hoa, RVN. Unlike the war, they won our hearts and minds. I’m so glad there’s documentary tribute to them. It’s long overdue. Thank you all for your selflessness–you made a huge difference for us all. Another terrific article about our project and The Donut Dollies. This one by Doug Imbrogno of the Charleston Gazette. It’s also being shared and reposted to a lot of other websites. Thanks, Doug, for the interest and support and for helping spread the word about the Donut Dollies and our documentary! Here’s a great recent article on PBS’s Next Avenue website, by journalist, writer and Vietnam veteran Doug Bradley that talks about the Donut Dollies, our documentary and our reasons for doing it. We really appreciate Doug’s support and the fact that he was able to publish the article while our Kickstarter campaign was still going on, which definitely helped more folks hear about us and get involved. As part of Alt 98.7’s Film Fan Contest, Norm was interviewed by DJ nationally known DJ Trey Morgan. Check out the spot that’s been airing on Alt 98.7 and the iheartmedia app below. Also, there’s still time to vote in the Film Fan Contest and help us win $2,500 for our project (plus a chance for you to win a $500 gift card!). Just click on this link and vote for The Donut Dollies! The Donut Dollies on the Radio – Vote for us in Alt98.7’s Film Fan Contest! Update: This contest wrapped up on 12/21. The winner will be announced in Los Angeles on January 8th, 2015. We’ll let you know the results asap. Thanks to all who voted for The Donut Dollies! The Donut Dollies Documentary has been selected for a Film Contest sponsored by LA’s Alt 98.7 and Land Rover of Encino. Whichever film gets the most votes by 12/21/14 will win $2,500 towards the completion of their project. And one lucky voter will get a $500 gift card to Arclight Cinemas! Please check out the contest, spread the word and vote for The Donut Dollies! Or, by going to: http://www.alt987fm.com/ and entering KEYWORD:EVOQUE in the keyword field on the top right. We started a Facebook page for The Donut Dollies back in May, and have been very excited to see it evolve into a place for folks to share memories and photos of Donut Dollies. To date, we have over 4000 likes, with more folks checking us out every day! Hopefully DonutDollies.com and the Facebook site will continue to grow and become a place for folks to connect, recollect and learn about The Donut Dollies. Check out The Donut Dollies on Facebook, and please “like” us and share our page! The Daily Hampshire Gazette did a great piece on Donut Dollie Dorset Anderson and our documentary project this summer. (link below). Writer Steve Pfarrer and photographer Carol Lollis were both terrific and very interested in the project. We’ll definitely let them know how things proceed as we gear up to return to Vietnam and film this fall!